Who Won the Ad War? We welcome this guest post by Michael Franz as part of our mini-symposium on campaign effects in the presidential election. The 2012 presidential election featured over 1.1 million ads on local broadcast station between June and Election Day. This was 40 percent higher in the 2004 and 2008 presidential campaigns. FEC reports suggest that both Obama and Romney devoted more than 50 percent of their record-breaking campaign budgets to advertising. All of this begs the question: what difference did it make? Travis Ridout and I investigated this question for the 2004 and 2008 elections and located significant effects of advertising on vote share in both years, but with much larger effects in 2008. 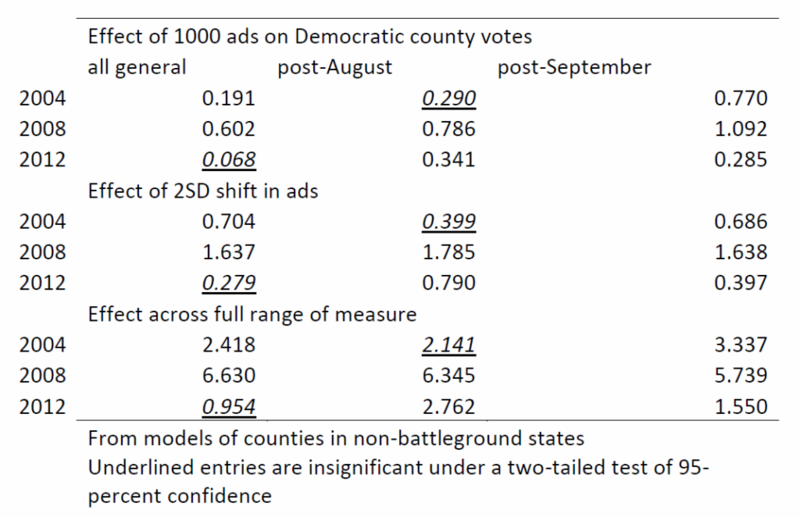 Our models leveraged the fact that media markets do not line up with state boundaries to compare counties in non-battleground states exposed to ads from battleground markets (e.g., voters in Massachusetts seeing ads in the Boston market meant for voters in New Hampshire) with other voters in non-battleground states exposed to little or no advertising. The advantage of the approach is that ads are essentially randomly assigned to non-battleground voters and no other confounding campaign activity—beyond media coverage of the candidates—is present. We borrowed this creative research design from Greg Huber’s and Kevin Arceneaux’s work. I take this same approach here to examine ad effects in the 2012 presidential election, comparing them to results from 2004 and 2008. My list of battleground states in 2012 is: Colorado, Iowa, Wisconsin, Ohio, New Hampshire, Virginia, North Carolina, Florida, Nevada, Pennsylvania, and Michigan. In examining these counties in non-battleground states that still saw advertising, the key factor is the Democratic advantage in ads aired at three time points: the full general election, the fall campaign, and ads aired in October. (All three measures are strongly correlated—for example, 0.75 for the full general and October ads—but because some research suggests that ad effects decay, it is useful to look specifically at ad buys late in the campaign.) The measure includes ads aired by all sponsors. Because ads are purchased for local broadcast at the market level, counties in the same media market each saw the same number of ads. I also account for many other factors, including the vote in the 2008 presidential election, median income in the county, a host of demographic variables, and indicators for each state. The results are reported in the table below. I show only the coefficient estimates for the ad advantage measures, but I show them in a few different ways. First, the effect for 1000 ads is the coefficient estimate of the ad advantage measure. 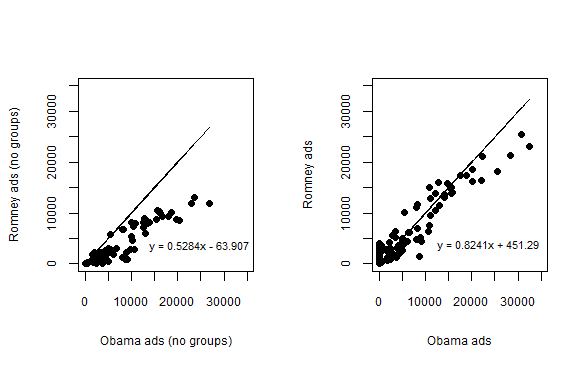 Second, I show the effect of a two standard deviation shift in the ads in either the Democratic or Republican direction. Third, I show the effect of flipping the market with the highest Republican ad advantage to one with the greatest Democratic advantage, holding all other variables constant. The results suggest that ads were significantly related to Obama’s county-level vote share in 2012, but the relationship was not as strong as in 2004 or 2008. In 2008, for example, an increase of 1000 ads in October brought with it about 1 percentage point. Moving across the full range of the measure could have netted either candidate nearly 6 percentage points. In 2012, 1000 additional ads bring only an additional 0.29 percent share of the vote, or 1.5 percentage points across the full range. Moreover, the effects in 2012 are generally smaller than in 2004. Such a result is not unexpected, of course, given that 2012 (and 2004) featured a highly recognizable incumbent president, limiting the room for movement in voter perceptions. This analysis does not allow, however, for a satisfying test of the effect of outside group ads. This is because ad totals across sponsors at the market-level are so strongly correlated with one another. In the immediate aftermath of the 2012 election, however, several news reports (here’s one) challenged whether the massive spending by outside groups on behalf of Republicans in the presidential (and congressional) elections was effective. This raises one intriguing possibility. It may not be entirely the case that the smaller effect sizes in 2012 are because of the presence of an incumbent on the ballot. Might it be that interest group ads specifically were of particularly lower quality? Consider: for most of the campaign, the president significantly out-advertised Governor Romney and the RNC. The left panel in the figure below plots all Obama ads against all Romney and RNC ads in all 210 media markets between April 25 and Election Day. The plot shows significant Obama advantages in ads aired. Indeed, for every 100 ads aired in a market by Obama, the Romney campaign mustered only 53. The right panel puts Democratic and Republican interest group ads back into the totals. The resulting plot still shows a systematic Obama advantage, but a significantly smaller one. It is possible that outside groups provided the boost necessary to retain or win some Romney votes that would have otherwise been moved by the great imbalance in Obama ads. A number of studies (here and here) conducted prior to the 2012 campaign explored such sponsorship effects in the context of fictional campaigns and generally found that interest group ads can be quite effective, perhaps more so than candidate-sponsored ads. On the other hand, Romney’s reliance on outside spending put a significant burden on those groups to produce and air ads that could resonate with voters. They may have done so—we need more research on this—but they may have also produced ads that were far less effective at mobilizing or persuading voters. This is one of the big stories of American elections moving forward. To what extent can campaigns that now rely on Super PACs depend on their efforts to campaign in ways that are effective? Super PACs may flout the coordination bans between candidates and outside group allies—and in ways that drive campaign finance reformers crazy—but their involvement also forces campaigns to rely on the wisdom and strategic decisions of those groups. That’s a huge transfer of authority in elections that might not be to the candidate’s liking. Indeed, Romney might have some opinions on that. Could Fossil Fuel Abundance Have Negative Political Consequences? 8 Responses to Who Won the Ad War? Michael . . . this is exceedingly interesting research. A bit of research on the success of individual ads in general and ads by outside groups; we tested 4 pro-Romney ads, including one ad from Americans for Prosperity, just before the first debate. We found that the AFP ad didn’t seem to persuade people, but it did appear to significantly impact enthusiasm . . . only among men. It boosted enthusiasm among male McCain voters, and sapped enthusiasm among male Obama ’08 voters . . . the AFP ad was meant as a swing voter persuasion ad, so it seemed to fail in its intended purpose, but possibly succeed in other ways. Of course, they were running the ad on broad-audience shows from what I gather, not ESPN, where it seems it should have run exclusively! One question . . . have you been able to use your data to gain any leverage on the “defining the candidate early” issue? Is there any evidence for or against the notion that early advertising defined Romney, or, as you reference in passing, is all the pre-August advertising essentially a waste? Did you run any models with pre-August instead of all general ads? And would it be possible to see the effect of just ads beginning, say, one week prior to early voting in each state? I ran a model that has just ads aired before September and the effect is zero. That’s expected given the work on how quickly ads decay. And expecting the bulk of ads that air in the summer to have a direct effect on election outcomes in November is a lot to expect. But this just raises the question of why so many ads air in the early period. That would need another post on the intersection of conventional wisdom in campaigns (that such ads can “define” an opponent) with any number of other effects we might expect to see with early ads (e.g., fund-raising bumps). As for the early voting, I haven’t done that, but early voting in states that have it generally start about 2 weeks to 30 days before Election Day, so the model with just ad buys in October picks up a late-ad effect on Election Day, plus a late-ad effect in many early voting states. Interesting . . . as you say, a lot to expect ads out that early to have an effect. Seems like the conventional wisdom of “defining” a candidate early is just crying out for some more nuanced testing. And it seems like conventional wisdom on this is, not surprisingly, a rather confused mess of potential impacts/rationales. I could see, for instance, the value of defining a MEDIA narrative about a candidate, which might be best done with extensive ad buys . . . not sure that’s the case, or how much power a campaign would have to define the narrative, but that’s at least a possibility. Then there’s the mass public, and clearly it just seems incredible that ads 5-6 months out from an election would do much if anything . . . I think underlying the conventional thinking, though, might be some inchoate sense that the “defining” is taking root subconsciously in the public, even if the conscious effect fades, and then it can be re-activated later on. Basically, priming attitudes for a very specific person early on. Again, a very tall order for some ads a few months out. But possible. The media narrative “defining” would be very difficult to test. But it seems like the “defining-as-priming” could be pretty easily tested (I’m assuming one would see no direct effect from a few months out). For instance, in VA this year. Low familiarity with the candidates for statewide office, early in the election still. One could expose Virginia voters to one or more (or no) early “defining” ads that are already out for that purpose, record attitudes, knowedge and vote pref, etc, re-survey them again in, say, a month or two, and then expose a random portion of the respondents to the same ads or the new ads later still . . . would the ads have a greater impact with those who were primed earlier? Who knows? I’d expect it wouldn’t. But I think it is a very interesting question, and would help but the “define early” rule to bed for good (or give it new life!) . . .
You say that in 2008, “Moving across the full range of the measure could have netted either candidate nearly 6 percentage points.” That’s an enormous effect! Can you provide some context about how much it would cost to air 6000 ads? Also, I’m more accustomed to reading Professor Sides downplay (but not treat as irrelevant) the impact of media on election outcomes on this blog. Professor Sides and Professor Franz — can you briefly reply or do a post about how this research comports with other literature on the subject? That IS a large effect, but it also amounts to buying about 11,000 ads in a single market (about 92 hours worth of air time) without any response from the opposing camp. If a presidential candidate did that in the final 4 weeks, I suspect it would not go unanswered. As such, that effect is not really one we’d expect to actually see. As for cost, that’ll depend on the market you are buying in, the mix of groups (who pay more) and candidates (who have the opportunity for the “lowest unit rate) in the ad buy. And so on. One thing I’ve been wondering for a while, and would love to test (although I can’t imagine I could get a campaign to actually do this); would a “shock and awe” political campaign be much more effective than a traditional one? 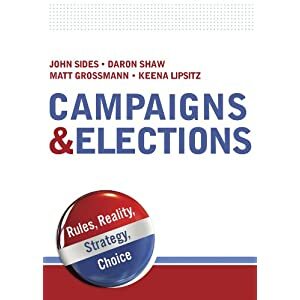 What if a candidate randomized all media markets into a traditional campaign and one in which no campaign efforts whatsoever were made until, say, 2 weeks prior to the start of voting (this would obviously be much easier with non-presidential, low-early/absentee voting elections)? That would be fascinating . . . I’d expect that such a strategy could be particularly effective in very low salience/turnout elections, like primaries, specials, etc . . .
“Shock and awe” might work for mail and tv, but not for canvassing and person-to-person voter contact. In most cases, it’s just not possible to mobilize that many people in such a short period of time.